We use mortgage payment calculators to help us calculate our monthly mortgage payment amount. 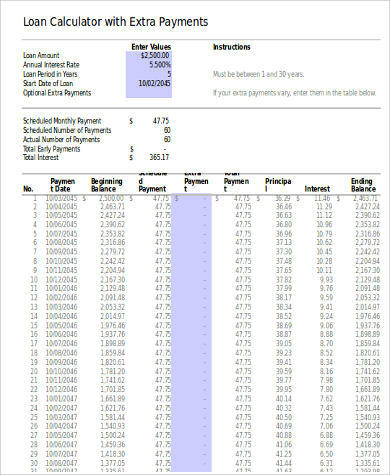 It helps us keep track of our mortgage payment schedules and how much we still owe. How about if we want to pay our debt faster than the agreed span of time? That is when we need to use mortgage payment calculators for extra payments. Extra payments will be used to reduce the amount of your principal balance. 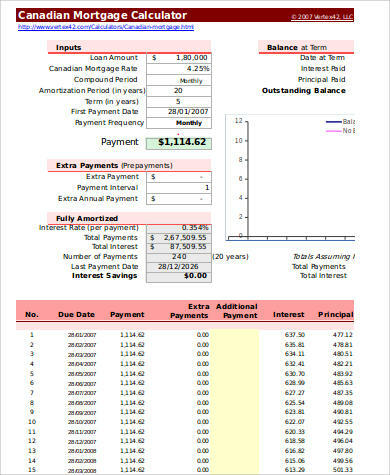 There are loans where the payments you make are used to pay off the interest first before the principal amount gets paid. Extra payments are good because you can reduce both interest and principal amounts together. 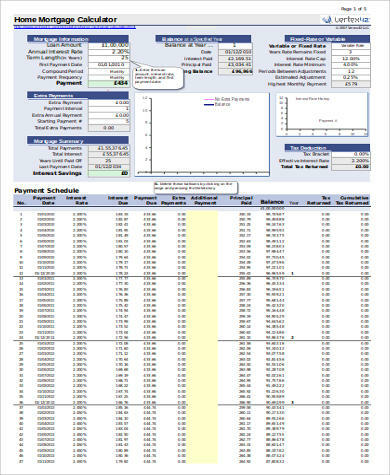 Also see sample timesheet calculators. Mortgage – Every mortgage loan requires a collateral to be secured, such as a house or any property. It is paid monthly with its corresponding interest. Property – This is the residence that is being financed. Principal – This is the original amount of money that the borrower wants to borrow without the interest. Interest – The banking or lending institutions will charge this to you as a fee for letting you borrow money. The rate differs depending on the lender. Repossession/Foreclosure – Mortgage loans should be paid on their respective payment schedules. Failure to do is will lead to the foreclosure or repossession of the property they have as collateral. Lender – They lend the funds or money to the borrowers. They are usually banking institutions, business society, lending institutions, and credit unions. Borrower – They are the ones that put their properties on mortgage, may be an individual or a business. Completion – It is just the start of the mortgage and the actual legal completion of the mortgage deed. Redemption/ Repayment – This is when the last outstanding balance is paid. It usually takes place after the end of the scheduled term. 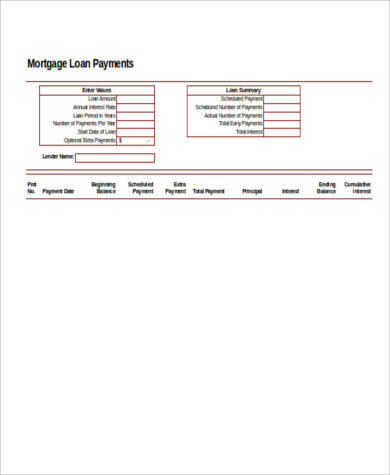 To know more about mortgages and other mortgage samples we have available, please see Assignment of Mortgage Samples and Payment Calculator Mortgage Samples. Mortgage underwriting is the process used by a lender to determine if the borrower is capable of paying the mortgage loan. It has certain parameters and is being done by mortgage underwriters. They analyze the borrower’s credit worthiness. The risks that they mostly consider are the 3 Cs: credit, capacity, and collateral. If the borrower is credit-worthy, then the mortgage loan is approved, otherwise it is denied. So the next time you decide to apply for a mortgage loan, make sure you have a good 3 Cs record. Reduces your loan’s principal amount. You will be able to pay your loan much more quickly. It can decrease years off your home loan. It can significantly reduce the total mount of interest you have to pay over time. It can reduce your tax. It does not serve as an advance payment. It will just reduce your principal balance, but you still will need to pay your monthly dues. You can save money, but they are not savings money. The funds are locked up and you can’t take them back during emergencies. Being on top of your mortgage payments will always be to your advantage. A great way to help you further with that advantage is by using mortgage payment calculators for extra payments. 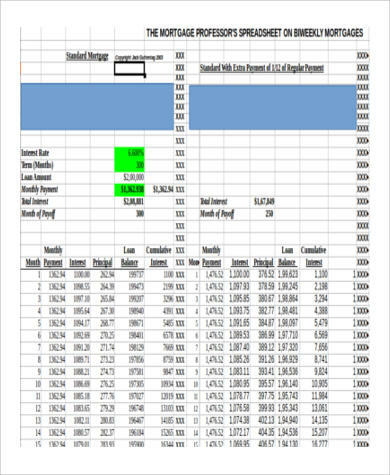 We also have Amortization Table Excel Samples available for download.